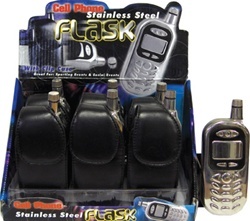 These cell phone flasks have a 4 oz capacity and measure around 5" tall. Each cell phone flask comes inside a faux leather storage case which has its own belt clip. There are 6 cell flasks per display.